Ever since the debut of Demon’s Souls, From Software has become one of the premiere developers in the action-RPG genre — particularly their own spin, often referred to as the “Souls-Like”. It makes sense, then, that people take notice whenever the company announces a new project, especially if said project is not another entry in the Dark Souls franchise. The most recent non-Souls title was, of course, Bloodborne, which was a more action-focused take on the core Souls design. And now we have Sekiro: Shadows Die Twice — in some respects, it emphasizes action even more but it also places a far greater emphasis on stealth and environmental traversal. The new game has been widely praised, but the rigid new combat system — and the punishment for player failure — raises some valid questions about the overall success of the design. Let’s take a closer look. Sekiro takes place in feudal Japan during a time of war. You play as a mysterious shinobi known as Wolf. As the game begins, we discover that Wolf is suffering from amnesia, and he’s on a quest to rescue the lord he had sworn to protect. Needless to say, Wolf faces an uphill battle right from the outset, losing his arm early on in a devastating combat encounter. Many obstacles stand between him and his goal: armies of bandits, vicious wild animals, various monsters, and his own forgotten memories. There’s a great deal to unpack here from a game design standpoint. So, let’s start by looking at how Sekiro diverts from the Souls-Like tradition. There is no more stamina, equipment, and character levelling — there are several, more abstract concepts that could be considered stand-ins for at least some of these (e.g. stamina is largely replaced by a concept called posture, equipment varies only in the context of the shinobi prosthetic tools, and character levelling is largely replaced by a system that enables iterative increases to health and attack power stats). Speaking of health/attack increases, mini-bosses (yes, there are mini-bosses now) and other boss-class enemies will drop resources that will allow you to upgrade said stats. Killing enemies will reward you with experience, but that experience is now used to unlock skills within Wolf’s overall skill tree. You can spend accumulated skill points on new moves, passive abilities, and more. And, unlike the Souls series that kept players’ feet firmly planted on the ground, Sekiro is all too happy to let you move, jump, and grapple your way around environments. It is true to say that the vertical space is as important — perhaps more important — than the horizontal space in Sekiro’s world. As a shinobi, it’s often important to gain a height advantage over your enemies, so that you can spy on them, plan routes of attack, and even drop down on them for a surprise strike. After losing your arm at the beginning of the game, you will soon encounter a character who will attach a prosthetic replacement for Wolf. This unique hardware is modular in nature, and allows for numerous configurations. The first of which enables you to grapple onto distant points in the world. This capability becomes a central component of Sekiro’s gameplay, and it fundamentally changes From Software’s approach to level design. In the Souls games, environments were typically quite narrow — though they folded in on themselves in clever ways and included numerous shortcuts, it wasn’t really possible to explore far beyond the rigid boundaries set by the creators. In Sekiro, levels feel larger in numerous respects — both wider and taller, owing to the ability to grapple and climb up over ledges. This increased size might confer new strategic options on the player, but I personally found that it somewhat confusing; that is, I found it more difficult to build a mental map of the levels. I also noticed that, for me, it seemed much easier to miss alternate areas, NPCs, and more. The way you move around the world has changed, and there’s a greater need to actively explore every corner if you don’t want to miss anything. Also, based on what I’ve played so far, I’m finding that the actual level designs don’t stand out/aren’t as memorable as notable locations like Anor Londo, Blight Town, and other iconic Souls places. I think one reason for this is that fast travel is an option right from the beginning, which means the levels don’t necessarily need to feel as physically connected (indeed, Hirata Estate and the Ashina area exist in physically different realms — at least, ostensibly). As you explore each area, you’ll likely find yourself using fast travel regularly, even within the same area. Before we get to stealth, I think it’s worth briefly touching on one more important aspect of Sekiro’s gameplay — it’s an element that reminds me a lot of Assassin’s Creed, actually. As I referenced earlier, stealth is a major aspect of the game’s design. Yes, you’re still fighting enemies one by one and each area will be full of enemies that are either standing around or actively patrolling. Stealth can be valuable here, because it enables you to whittle down groups to make them more manageable, or take out the strongest enemy first. As with any other game that leans into stealth, all the bread and butter moves are here — you can peak around walls, hide in tall grass, perform stealth kills from above, and more. If you’re spotted, enemies will become alerted to your presence, but you can leave the area and wait until they go back to their business. Of course, not every encounter can be approached stealthily — this is certainly true of major boss encounters. So, now that I’ve got that throat clearing out of the way, let’s dive into combat itself. This is where Dark Souls fans will be in for a rude awakening. If you’re expecting Sekiro to be like Dark Souls or Bloodborne in terms of combat, you’re sorely mistaken. For one thing, the combat here feels faster than previous From Software games — perhaps even outpacing Bloodborne. That said, combat here is more focused on out-thinking your opponent rather than simply barreling into them at speed. Every enemy in the game has a health and posture bar, and as you attack them and keep on the offensive, their posture bar will fill up. Disengaging from the enemy (or going on the defensive), will cause the bar to drain. When the posture bar is filled, you’re able to perform a “deathblow” — this move instantly kills minor enemies. But for bosses and mini-bosses, you’ll have to cut through multiple health bars in order to defeat them. Each deathblow (whether triggered from direct confrontation or via a stealth attack) will take out one of these health bars. As you fight the enemy and land more damage, it’ll become easier to damage their posture, getting them closer to a deathblow. While all this is happening, enemies will be attacking you. You have your own posture as well, and you can be staggered if you block too many attacks. You’re going t quickly find that this situation encourages you to be more aggressive in combat generally — that is to say, you’re encouraged to be on the offensive more often than not. Playing defensively won’t tend to progress the battle. Key to all of this is to learn and understand enemy movements so that you can effectively begin to do health and/or posture damage. Another wrinkle here is that you can carefully time your blocks in order to parry/deflect enemy attacks. This will damage their posture, but it will also allow you to perform a counter-attack. In some cases, you can dodge and counter-attack to do increased damage. This is where the nuance of enemy movement becomes important — enemies will start to use unblockable attacks that require specific counters. These are called “perilous attacks” and are visually flagged with a bright red Japanese character appearing on-screen as the move begins. There are various kinds of perilous attacks — thrusts can be countered with a specific unlockable skill, sweeps can be avoided with a jump, and grabs can be dodged. In all of these cases, the game follows an avoid-and-counter pattern. Although dodging might seem easier — and it’s certainly something Souls veterans will be used to — and in many cases, it will allow you to avoid attacks and perform a counter. For many, deflecting attacks will be more difficult, at least initially. But in general, deflection/parrying sits at the core of Sekiro’s combat. If you are unable to learn how to do it, combat will generally be more difficult for you. That said, every enemy is different: some enemies will perform attacks that can’t be deflected, and will require another response (especially the perilous attacks mentioned above). All of this may sound great. But my personal experience with the game was a mixed bag in terms of combat. I have some criticisms that others players may or may not share. Let’s go through them. I think the best action games are all about giving the player the tools to succeed while requiring the player to effectively read their opponents and react accordingly. While playing Sekiro, I had trouble with both aspects of this equation. One of the attributes that you’d expect a shinobi to have is speed. But I felt that Wolf was generally the slowest combatant on the field. Enemies can dodge around you, they can interrupt your attacks, and their combos often seem longer and more damaging. Given the speed of enemies, I was surprised to find that there is no dodge canceling, or any canceling of animations in this game. At most, you can dodge before your attack animation initiates, but that’s it. If an enemy begins their attack while you are attacking, there is no way to avoid damage. Sometimes enemies can be interrupted, but most of the time you’re going to take damage. An element that compounds this situation is that Wolf seems to get animation locked if he gets hit — if a combo connects, it can be difficult to escape it. And, if you get hit while holding the block button, you’ll need to hold the button again to start blocking again (the game won’t retain your block position). In terms of action game design, Sekiro features possibly the highest number of attack animations I’ve seen in a video game. This can be good and bad — as the player, you have to constantly adjust combat strategy depending on the enemy you’re fighting, but I found it frustrating to do so. Earlier, I talked about the game’s three defenses — parrying, dodging, and jumping, and how they were built to counter specific attacks. One problem I have with Sekiro is that I find it difficult to read enemy attacks at the point where I need to make a decision about which defense to use. This is perhaps because of the speed of combat — like the Souls games to a degree, Sekiro’s enemies will telegraph at the beginning of an attack animation. This telegraphing marks the point where the player needs to make a decision about which way they should respond. In my case, I found that it was tricky to answer this question quickly enough — by the time I had it figured out, the enemy had hit me for a lot of damage. Another compounding factor for me was the game’s camera, which I felt was often not optimal in terms of giving me the best angle for an encounter. At times it would get stuck, for example. This wouldn’t be a Souls-Like without there being a punishment system and some kind of associated confusing mechanic. In this case, I’m talking about something called Dragon Rot. Like bosses, Wolf has multiple health bars (or, lives). When you die, you can come back to life once more before you’re actually dead. Every time you die completely and respawn, you’ll lose some of your experience and half of your sen (money). A passive attribute called Unknown Aid sits as a backdrop to this system, which gives you a percentage chance of not losing anything when you die. The more you die, the more you spread a mysterious disease called Dragon Rot. Over time, this ailment begins to affect NPCs in the world who give out quests or special items. As well, every new Dragon Rot “point” causes the Unknown Aid percentage to drop. This system reminds me of Demon’s Souls, in the sense that it incorporates a mechanic that makes the game tougher for less skilled players. I actually thought that you were penalized for using the ability to self-revive too much in the game and so I purposely accepted “full deaths”. This is actually not the case — the more I accepted “full deaths” in place of revival, I was actually making things more difficult all while trying to learn the game. In my view, this is simply poor design — there’s no risk/reward element that I can see, and it doesn’t affect expert players at all; it’s simply a longterm punishment mechanic that impacts the people who simply don’t need more punishment. My suggested alternative design is to make Dragon Rot a chance to increase every time you choose to revive yourself mid-combat (rather than occurring when you die and return to a checkpoint). This would actually provide a more immediate risk versus reward system and wouldn’t overtly punish players for learning the game. If you’re looking for a game that gives you a palette of tools and simply allows you to “go nuts”, you might want to look at something like Devil May Cry 5. 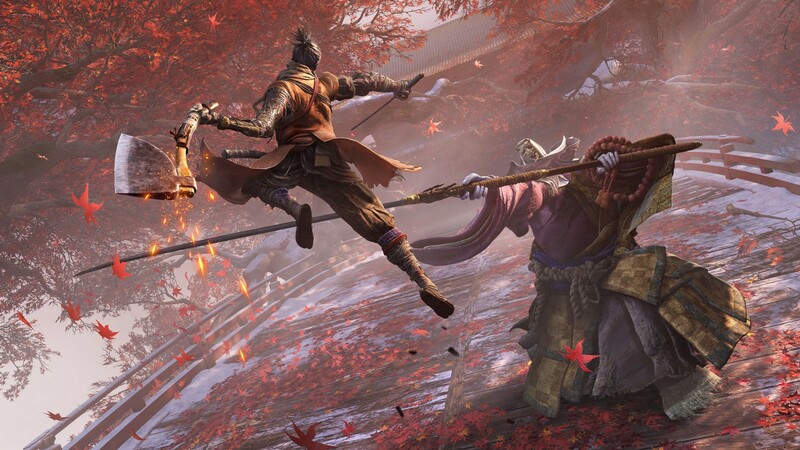 Sekiro’s core combat mechanics are less open-ended, and are more about “solving the equation” when it comes to enemy patterns, behaviours, and other game mechanics. Despite this, I must admit, I didn’t feel joy when beating any of the game’s bosses. Instead, I found myself getting frustrated over other issues — like the camera, or the responsiveness of Wolf himself. There has been a great deal of discussion around this game, and I’m surprised that the experience I’m having doesn’t seem to be shared by many other players — I’m having misgivings about the experience, but I’m also continuing to play through and break down the game in finer detail. Let’s see how it goes.